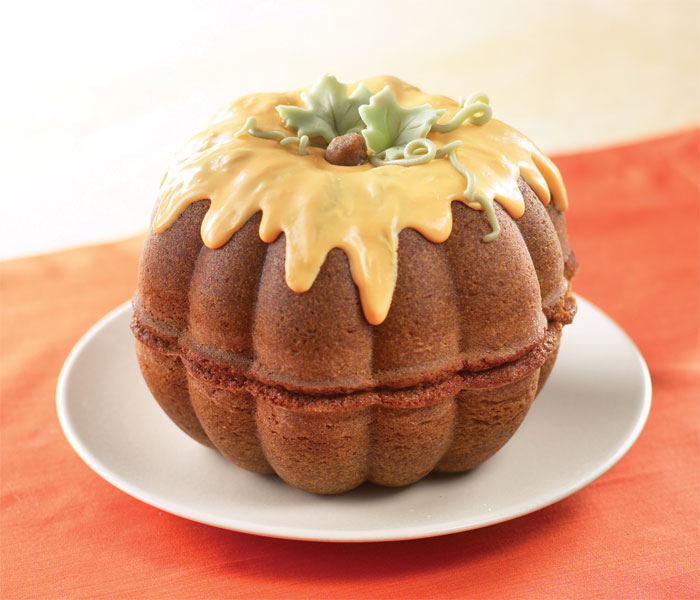 What better way to get into the spirit of fall than with with a cake that looks like a pumpkin? There’s nothing better than the welcoming aromas of spice cake baking on a brisk autumn day. Our pumpkin spice cake is filled with buttercream icing and topped with a fondant stem and leaves. Poured icing gives it the final touch. Use our Pumpkin Cake Pan. 1. Preheat oven to 325°F. Grease and flour pan or spray with vegetable pan spray with flour. 2. In medium bowl, combine flour, pumpkin pie spice, cinnamon, baking powder, baking soda and salt; set aside. In small bowl, mix together sour cream, molasses and syrup; set aside. 3. In large bowl, beat butter and sugar with electric mixer at medium speed until light and fluffy. Add eggs, one at a time, and maple extract, mixing well after each. On low speed, add flour mixture alternately with molasses mixture, starting and ending with dry. Blend well. Divide cake mixture evenly between each cavity. 4. Bake 45-48 minutes or until toothpick inserted into center comes out clean. Cool cake in pan on cooling grid 15 minutes. Remove from pan; cool completely. 5. Trim crowns from each cake. Place bottom cake on serving plate. Spread a thin layer of buttercream icing on cake bottom then place pumpkin top over to form a pumpkin. Tint remaining icing green and orange, decorate as desired.